Los Angeles County, CA – The Heart of LA Democratic Club (HLADems), a year-old Los Angeles County-wide Democratic club which promotes equality and the full representation of women in local, state and national politics, voted to endorse Eleni Kounalakis Lieutenant Governor of California. Founded in March 2017 on the heels of the Presidential election, the Heart of L.A. Democratic Club was founded in recognition of the growing awareness within the Democratic Party that women should be fully and equally represented both in the political community and the national body politic. Heart of L.A. Democratic Club is open to all Democrats who subscribe to the club’s goals and purposes regardless of their gender identity. The mission of the Heart of L.A. Democratic Club is to help make the Democratic Party, the body politic and its elected officials responsive to, and responsible for, the needs of all people, particularly, though not exclusively, women in our community. 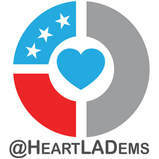 In addition to endorsements, HLADems actively participate in political advocacy, as well as voter and community outreach. Monthly meetings feature guest speakers who include Democratic candidates, experts on policy and political processes, reproductive justice, homelessness, and more.